(1)Department of Neurosurgery, Hospital General Universitario de Alicante. Alicante, Spain. The retrosigmoid approach can be performed with the patient in the sitting, park-bench, lateral or supine position with the head rotated maximally to the contralateral side. In the lateral and park-bench position an axillary roll for the down side arm is mandatory. A lumbar drainage may be helpful for large tumors. 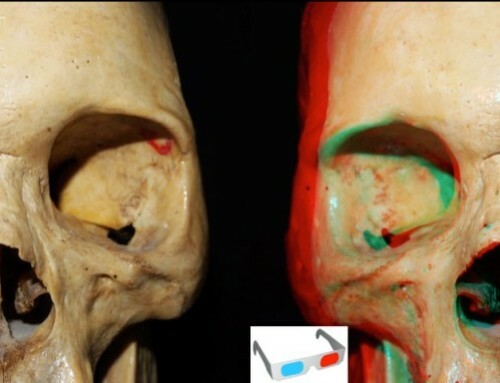 Important landmarks for posterior fossa surgery include the mastoid groove and tip, the inion and the line that connects the posterior root of the zygoma and the inion. 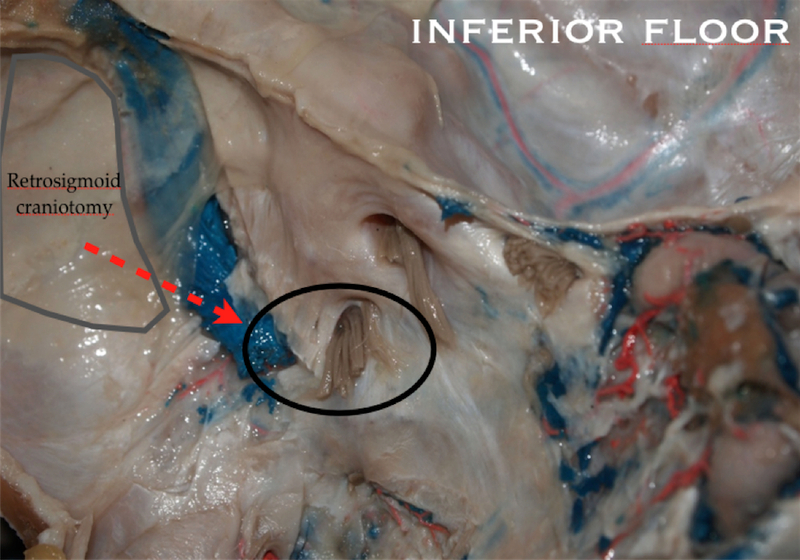 The asterion (asterisk) and the vertical projection of the digastric notch or mastoid groove (blue line) allow a good estimation of the extracranial projection of the transition of the transverse–sigmoid sinuses. 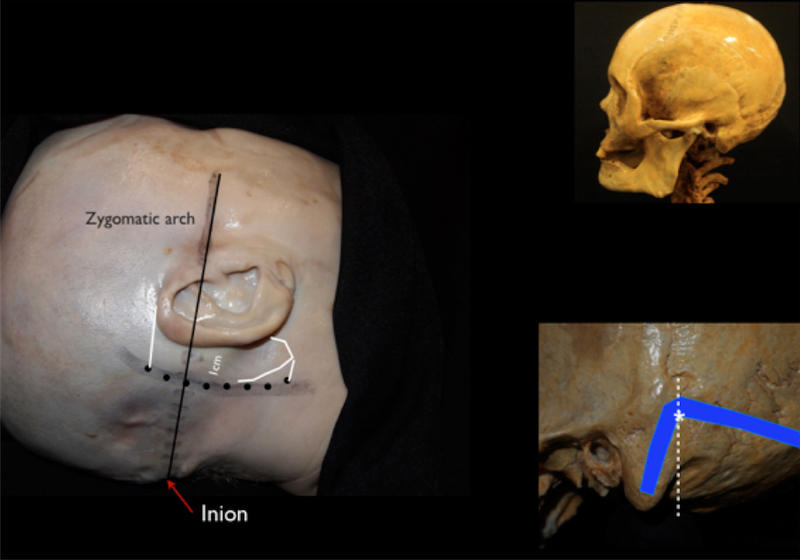 A slightly curved skin incision is drawn with a skin marker extending superiorly 1-2 cm behind the pinna, passing through the asterion and terminating 1–2 cm medial to the mastoid tip. The inferior border of the skin incision depends on the need of caudal extension. 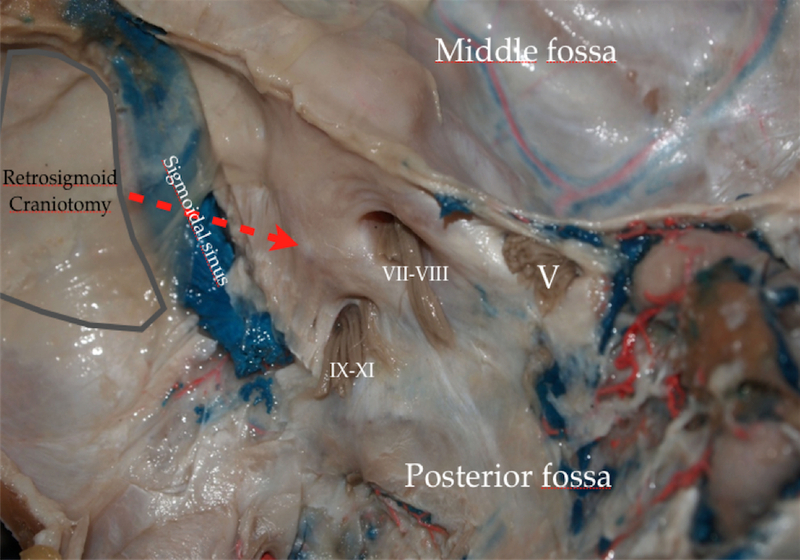 The occipital artery has been disected and exposed in its trajectory from the digastric muscle to the superior nucal line. The muscle stage has no important structures we must take into account. Therefore the neck muscles are divided in line with the skin incision and retracted. L: Lambdoid suture; M: Mastoid process; O: Occipital bone; o-m: Occipito-mastoid suture; P: Parietal bone; p-m: Parieto-mastoid suture; White circle: Asterion point. 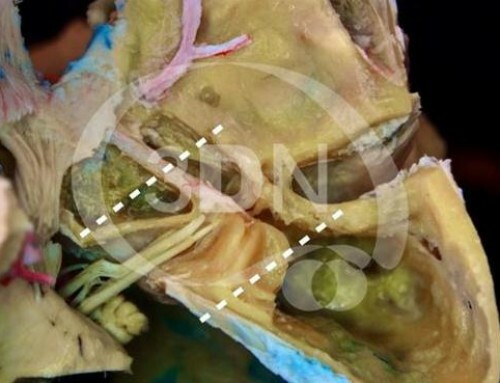 The burr hole is made on or below the asterion and then a suboccipital craniectomy is perfomed with hill-speed drill.The emissary vein usually serves a reliable landmark to find the position of the sigmoid sinus. DN: Digastric notch; EV: Emissary vein; M: Mastoid tip. 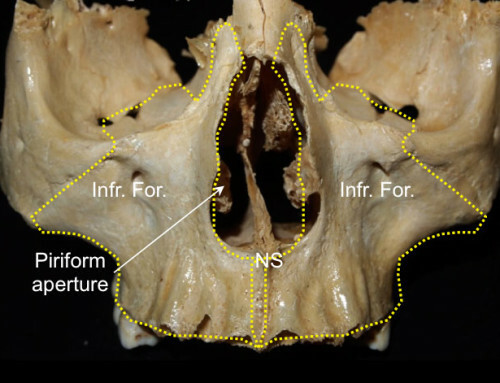 A high-speed diamond drill is used to expose the borders of the transverse sinus, the transition of the transverse–sigmoid sinuses, and the sigmoid sinus. Continuous irrigation provides cooling during drilling. Bone wax is used to pack the mastoid air cells and the emissary vein. Care should be taken with the emissary vein when operating on a patient in the semisitting position because its laceration may precipitate the formation of an air embolus. SS: Sigmoid sinus; TS: Transverse sinus; Yellow area: Area drilled to expose the sigmoid sinus (a partial exposure is usually enough). The dura is opened in a C-shaped, medially based fashion along the transverse and sigmoid sinus under magnification using an operating microscope. The opening is performed some millimeters away from the sinuses to allow closure. 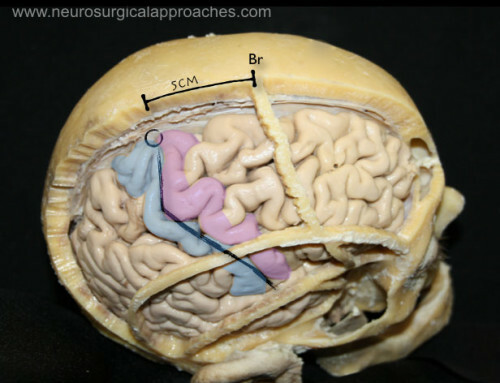 Three or four tack-up sutures are placed with further in- crease of the surgical view, thereby reducing the amount of cerebellar retraction required. Cer: Cerebellum; SS: Sigmoid sinus; TS: Transverse sinus. A narrow brain retractor is located on the petrosal surface of the cerebellum. We use cotton strips to protect the cerebellum against lacerations. With a narrow brain retractor and a fine bayonet forceps, the surgeon opens the cerebrospinal fluid (CSF) cisterns. Further brain relaxation may be achieved with mannitol administered intravenously at the time of skin incision. 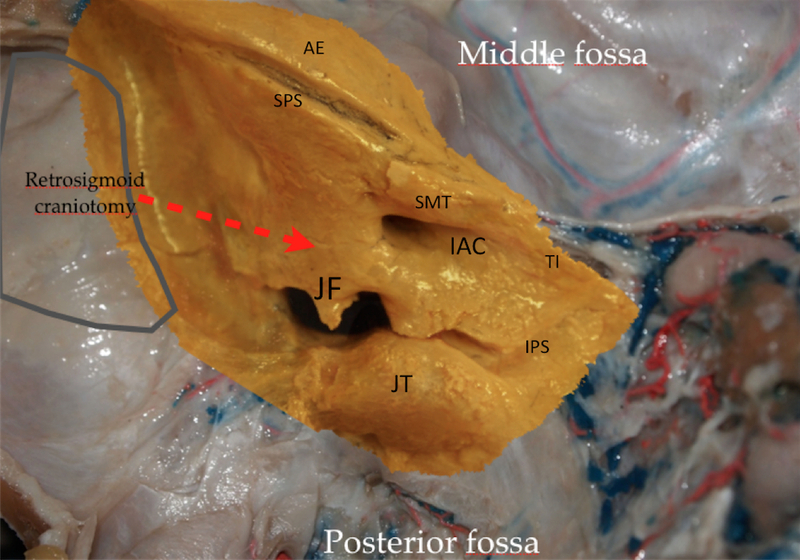 AE: Arcuate eminence; IAC: Internal acustic canal; IPS: Inferior petrosal sinus; JF: Jugular foramen; JT: Jugular tubercle; SMT: Suprameatal tubercle ; SPS: Superior petrosal sinus ; TI: Trigeminal impression. 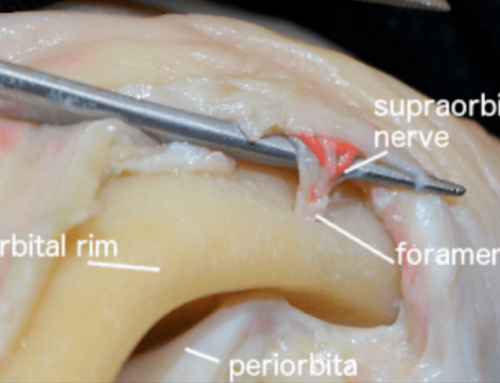 AICA: Anteroinferior cerebellar artery; C: Cerebellum; PB: Petrosal part of the temporal bone; SPV: Superior petrosal vein; SMT: Suprameatal tubercle; T: Tentorium;; V*: Motor roots of the trigeminal nerve. AICA: Anteroinferior cerebellar artery; C: Cerebellum; CN: Coclear nerve (not visible from RSA, anterior to the IVN); C: Cerebellum; FN: Facial nerve (not visible, anterior to the SVN); IAC: Internal acustic canal; VN: Inferior Vestibular nerve; Lab.A: Labyrinthine artery; PICA: Posteroinferior cerebellar artery; SMT: Suprameatal tubercle; SPV: Superior petrosal vein; SS: Sigmoid sinus; Sub.A: Subarcuate artery; SVN: Superior vestibular nerve. JF: Jugular foramen; Vert A.: Vertebral artery.